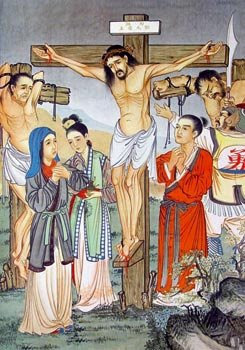 In the light of the Resurrection of Christ, "special value is accorded to commemoration and prayer for the missionary martyrs who died in 2007, while they were carrying out their missionary service. This is a duty of gratitude for the entire Church, and an encouragement for each of us". These were some of Benedict XVI's words following the recitation of the Regina Caeli, on the occasion of the annual day of prayer and fasting for missionary martyrs. This commemoration is observed today, on the occasion of the anniversary of the martyrdom of Oscar Arnulfo Romero, archbishop of San Salvador. This day, which is usually dedicated to prayer and fasting, falls on the first day after Easter. The pope cheerfully suggested, given the festive atmosphere, not to fast, but to pray: "To remember and pray, but perhaps not to fast, for these our brothers and sisters - bishops, priests, religious men and women, laity - who died in 2007, while carrying out their missionary service, is a duty of gratitude for the entire Church, and an encouragement for each of us to bear witness in an increasingly courageous way to our faith and hope in Him who on the Cross conquered forever the power of hatred and violence with the omnipotence of his love". 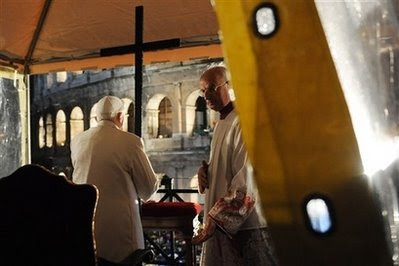 Before the prayer, which replaces the Angelus during the Easter season, the pope recalled that "at the solemn Easter vigil, after the days of Lent, there returned the singing of the Alleluia, a universally familiar word that means 'praise the Lord'. During the Easter season, this invitation to praise leaps from mouth to mouth, from heart to heart. It resonates beginning from an absolutely new event: the death and resurrection of Christ. The Alleluia sprang from the hearts of the first disciples of Jesus that Easter morning, in Jerusalem". 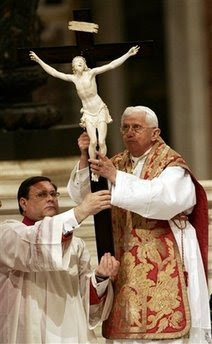 From that same experience, Benedict XVI continues, "is derived also the prayer that we recite today and every day during the Easter season in the place of the Angelus: the Marian antiphon Regina Caeli. The text is short, and has the direct form of a proclamation: it is like a new 'annunciation' to Mary, not made by an angel this time, but by Christians who invite the Mother to rejoice because her Son, whom she bore her womb, has risen as He had promised". It is to be hoped, the pope continues, "that the Easter Alleluia may be profoundly impressed upon us as well, so that it becomes not only a word, but the expression of our life itself: the existence of persons who invite all to praise the Lord, and do this through their behaviour as 'risen' persons. 'Pray to the Lord for us', we say to Mary, so that He who, in the resurrection of his Son, has restored joy to the entire world, may grant us to taste this joy now, and in the life without end". In conclusion, Benedict XVI recalled the world day for the fight against tuberculosis, and said that he is "particularly close to the sick and to their families. I hope that the effort to overcome this scourge may increase on a worldwide level. My appeal is addressed above all to the Catholic institutions, so that those who suffer may recognise, through their work, the Risen Lord who gives them healing, comfort, and peace". Dear brothers and sisters! Let us allow the light that streams forth from this solemn day to enlighten us; let us open ourselves in sincere trust to the risen Christ, so that his victory over evil and death may also triumph in each one of us, in our families, in our cities and in our nations. Let it shine forth in every part of the world. In particular, how can we fail to remember certain African regions, such as Dafur and Somalia, the tormented Middle East, especially the Holy Land, Iraq, Lebanon, and finally Tibet, all of whom I encourage to seek solutions that will safeguard peace and the common good! 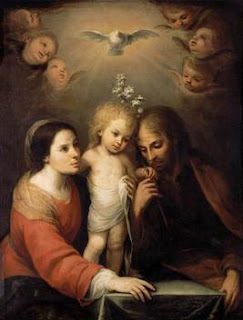 Let us invoke the fullness of his Paschal gifts, through the intercession of Mary who, after sharing the sufferings of the passion and crucifixion of her innocent Son, also experienced the inexpressible joy of his resurrection. Sharing in the glory of Christ, may she be the one to protect us and guide us along the path of fraternal solidarity and peace. These are my Easter greetings, which I address to all who are present here, and to men and women of every nation and continent united with us through radio and television. Happy Easter! The office of Master of the Liturgical Celebrations of the Pope is important because, if it is true that lex orandi lex credendi (the Church believes in that which She prays [Rodari's translation]), then to direct the papal ceremonies with rigour and faithfulness to the norms is a help to the Faith of the entire Church. "The liturgy of the Church - explains Marini -, with its words, gestures, silences, chants and music causes us to live with singular efficacy the different moments of the history of Salvation in such a way that we become really participant in them and transform ourselves ever more into authentic disciples of the Lord, walking again in our lives along the traces of Him who has died and risen for our salvation. The liturgical celebration, if it is truly participated in, induces to this transformation which is the history of holiness." And a help in this "transformation" can be that "repositioning" of the Cross in the centre of the altar, which has been carried out in the papal liturgies, as a residue [Rodari's word] of the old "orientation towards orient" of churches towards the rising Sun, Him who is coming. "The ion of the Cross at the centre of the altar - says Marini - indicates the centrality of the Crucified in the eucharistic celebration and the precise interior orientation which the entire congregation is called to have during the eucharistic liturgy: one does not look at each other, but one looks to Him who has been born, has died and is risen for us, the Saviour. From the Lord comes the salvation, He is the Orient, the Sun which rises to whom we all must turn our gaze, from Whom we all must receive the gift of grace. The question of liturgical orientation, and also the practical manner in which it takes shape, is of great importance, because through it is conveyed a fundamental fact, at once theological and anthropological, ecclesiological and relevant for the personal spirituality." Penitent Fernando Mamangan weeps in pain as he is nailed to a wooden cross in a voluntary crucifixion on Good Friday in Santa Lucia village March 21, 2008. 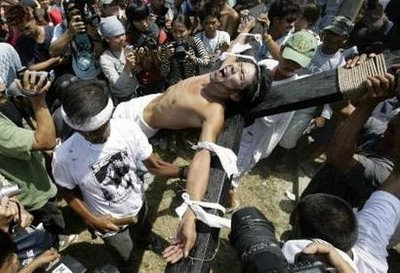 Filipinos including a 15-year-old were nailed to crosses and scores more whipped their backs into a bloody pulp on Friday in a gory ritual to mark the death of Jesus Christ. This is not a discussion of censoring works of art like VM. They are easily available to any who wish to view them. It is the failure of Notre Dame to become a place where such sin is not celebrated. Can’t there be one “last homely home,” one last Rivendell, where an alternative culture can exist? Must one allow sin, blasphemy and the celebration of the unholy, to live the examined life? Aquinas did not think so. Socrates did not either. What does the President of Notre Dame know that they did not? 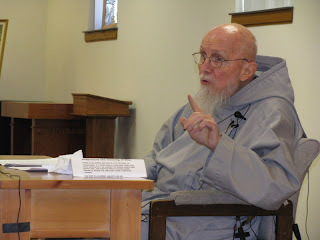 Once a mind has been debased, Sacred Scriptures and the Holy Fathers make it clear that purity is difficult to regain. What academic merit would justify such a thing? The notion that having one token Catholic to respond on a “panel” to a forceful dramatic presentation is so weak and impotent as to merit pity or laughter more than anger. It is as if the owner of a home felt honored that he was allowed one seat at his own dinner table, dominated by barbarians. The sheep have invited the wolves to dinner, but a shepherd will comment after the meal. 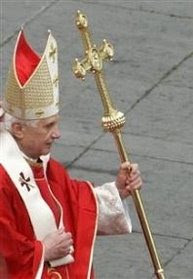 The Holy Father used the crosier (papal cross) of Pius IX and XII in today's Palm Sunday liturgy. Chances are this is only a temporary change--even Pope John Paul II used several different "ferula"